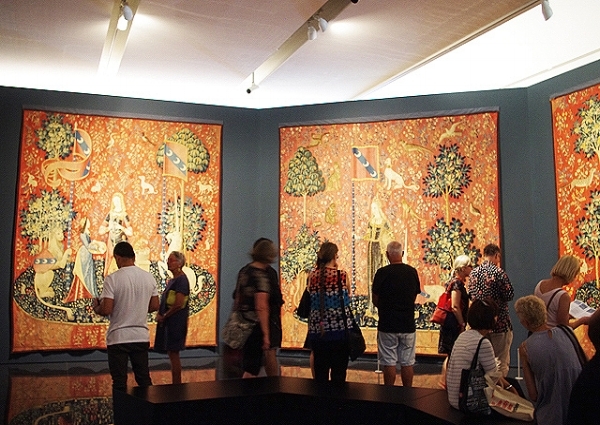 The Lady and the Unicorn opened this Saturday 10th of February at the Art Gallery of New South Wales and is a must see for lovers of tapestries and French art. School aged kids and their carers will enjoy this exhibition along with the cute children's trail, the making space and the discovery space. At the center of the exhibition is the tapestry room where The Lady and the Unicorn's six tapestries are located. The tapestries were thought to have been created around the 1500's however little is known of their early years. They were rediscovered in the Château de Boussac, a small castle in Creuse in central France. In 1841, Prosper Mérimée, inspector general of historic monuments recognised the tapestries as exceptional in both original and quality and recommended they be purchased for the state. They have lived at the Musée de Cluny - Musée national du moyen Âge in Paris since and they continue to reveal a poetic medieval world of the senses, the spirit, romance, chivalry and morality still today. Each tapestry includes medieval symbols such as the dog, fox, heron and falcon fighting, lion, magpie, monkey, rabbit, unicorn and more. Each symbol has a meaning. The precise meaning of these tapestries has been debated for years. The most widely accepted meaning today is that of an allegory of the five senses: sight, hearing, smell, taste and touch. A gorgeous making space is located at the left of the tapestry room which invites visitors to reflect and experiment with fabric. Kids can pickup a loom and some wool and try out traditional weaving processes and read books about tapestries and the medieval world in the space. A tranquil discovery space located at the right side of the tapestry room invites visitors to find out more about tapestries and how they are created. A cute children's trail activity book is available for free as you enter the exhibition or at the information desk. Children are invited to look closely at the tapestries, find animals and flowers, meet the majestic lion and unicorn and learn a little French along the way. Numerous events, programs and hands-on workshops will take place at various times during the course of the exhibition so be sure to check dates before you head to the exhibition. The Lady and the Unicorn is on now at the Art Gallery of New South Wales until Sunday 24th of June 2018. For more information about this exhibition, head to the Art Gallery of NSW's website.